Today I was a little bit upset because I had a dispute with someone. I didn´t want to think about it the whole day and thought I need distraction. 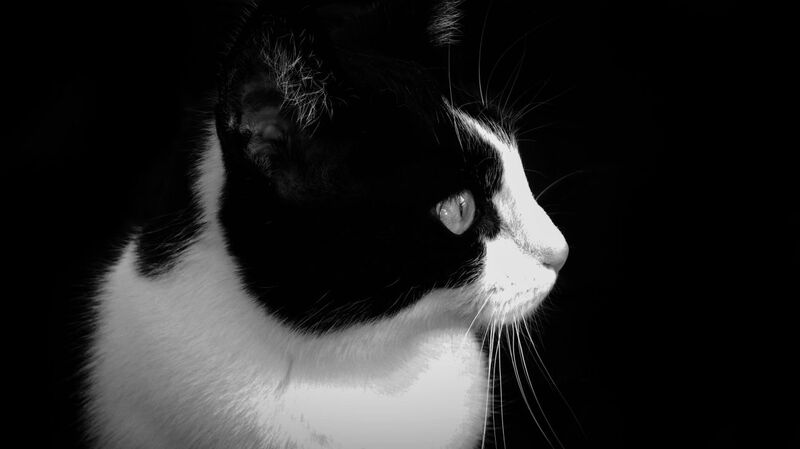 I searched for an image that I could edit and found one of my cat Shyna that I didn´t share yet. I disliked the photo but I believed that it wouldn´t look too bad if I change some things with Adobe Lightroom and Photoshop. I removed the background or darkened it to black as I did this quite often with photos and I like that. The white fur was heavily overexposed but decreasing the exposure and lowering the highlights and whites did help at least a little bit. I decided to change the whole image to black and white to even make it less conspicuous. I think it´s still visible but it does not look too bad now I guess. I think I like that photo now, and at the end, working on it helped me to calm down. It´s helpful if you have interests that can take your mind off things. I think it looks great Dennis. I would not have noticed the over exposure if you had not pointed it out. I think I take it sometimes too serious. Agree, certain errors must not mean that a whole image is bad. But on the other side, it´s fun to take a second look to improve some stuff. True. This works with many other activities too, such as playing guitar or what not. This is how I disconnect from a bad day. I like the photo Dennis. I suspect that you may be a perfectionist where photography is concerned but I agree with you that working on something interesting is a good way to relieve stress. Haha, yes I am at times very skeptical about my own photos, unless I think they are just hasty snapshots. Agree, most activities can be very stress relieving. It´s good to tinker about problems but we shouldn´t do that for too long.